Since 1879, Saint Patrickâ€™s has provided the faithful of New York, and the world, a place to find God among the hustle and bustle of Manhattan. The story of New Yorkâ€™s great cathedral mirrors the story of the city itself. Created to affirm the ascendance of religious freedom and tolerance, St. Patrickâ€™s Cathedral was built-in the democratic spirit, paid for not only by the contributions of thousands of poor immigrants but also by the generosity of 103 prominent citizens who pledged $1,000 each. It is located on the east side of Fifth Avenue between 50th and 51st Streets in Midtown Manhattan. 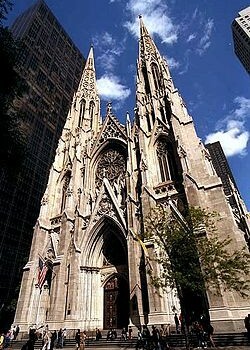 The Cathedral, commonly called St. Patrick’s Cathedral, is a decorated Noe-Gothic-style Roman Catholic cathedral and a prominent landmark of New York City. It is the seat of the archbishop of the Roman Catholic Archdiocese of New York, and a parish church.Â An extensive restoration of the cathedral was begun in 2012 and lasted 3 years at a cost of $177 million. The restoration was completed by September 17, 2015, before Pope Francis visited the cathedral on September 24 and 25, 2015. 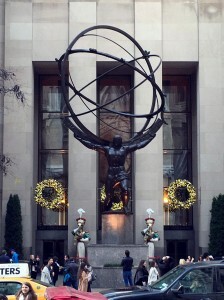 The directly across the street from the cathedral is Rockefeller Center and specifically facing the Atlas statue.